Here are two fairly provocative but extremely interesting articles about housing, from Dan Davies and Andrew Lilico. (Before he developed his Brexit-Corbyn monomania.) Taken together they argue that the overall state of the UK housing market can't usefully be described as a crisis. How could someone think this? 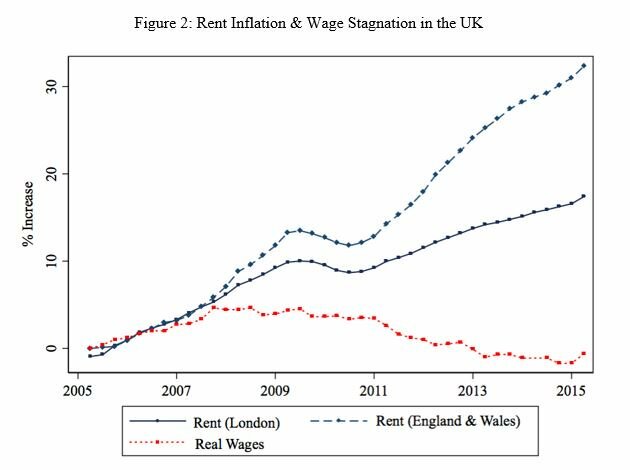 Well, as some of the charts in my post from last week indicate, rents have actually not been growing very quickly in the UK - increases in rent have been less than the CPI, which means that rent has actually become cheaper relative to other goods over the last decade. If demand for housing was increasing (through population growth) much faster than supply, scarcity would be pushing rents up much more quickly. It hasn't. Prices have increased a lot but, the argument goes, that's largely because interest rates have been falling to historic lows and mortgage credit has become more widely available. There are a few ways to think about this. First, imagine you're prepared to spend about £2000 a month on housing. If the interest rate is 9%, you can afford to borrow £250,000 over thirty years. If it falls to 5%, you can borrow nearly 400,000. (I used this tool.) But since everyone else's borrowing power is also increased in the same way, the outcome is that you end up paying the same £2000 a month for the same house - just at a significantly higher face value. Alternatively, think about other investments: when interest rates fall, the return you get on (for example) government debt or a bank deposit falls. But nobody ever cuts rents. So housing becomes a more attractive investment and money flows to it. The prices gets bid up until the returns are, as a percentage of the cost of the asset, roughly equivalent to the returns on other types of investment. In both these stories house prices go up without changing the monthly cost people have to pay for somewhere to live. So... no crisis? Far from it. There are three things that mean there's still an acute problem, even if it's not quite the one everyone's diagnosing. More and more of people's income is being eaten up with housing costs, even though those costs aren't increasing much, because incomes have stagnated and government assistance has been slashed. This is a problem, but obviously one that goes way beyond housing. The second issue, which might be more relevant to the current political dynamics of the country, is that even if rising prices don't affect the month-to-month cost of homeownership (because of low interest rates), they do increase the amount you need to have saved for a deposit. So even though you can afford to own a house that costs eleven times your income, you can't afford to buy it. The consequence is you don't benefit from increasing home values, and your wage stagnation means you don't get much other opportunity to save either. That's how you get a fifty per cent gap in wealth between people who were born not even a generation apart. The third problem is that the private rental sector in the UK, much like in the US and Australia, is characterised by insecure tenure and limited tenants' rights. (As the Davies article linked at the start points out, this is not really a coincidence: these conditions are what makes it possible to treat housing as a financial asset.) Absurd buzz about the 'Spotify generation' aside, nobody is indifferent between renting and owning because only ownership really gives you control over your living situation. It doesn't have to be that way. In many parts of Europe residential tenancies have longer terms and much more restrictive rules about evictions. Tenants have much more extensive rights to modify and maintain the property they're living in. One virtue of this policy setup is that there's not even any need to decide exactly why you're doing it. Making renting better means that it's not so important to own a house. But it also means investors and lenders can't treat houses as financial assets so easily, limits how much prices react to interest rates and general investment, and so means price increases will be much more modest. All you have to do is quite dramatically change the terms of an investment made by a large number of Tory-voting buy-to-let landlords. So any day now.